Last week in class, Jimmy was telling us that he'd been on---I was only half listening while foiling lamp pieces---some sort of architectural/stained-glass tour of D.C. I don't know what it was or who put it on, but it sounds like fun and I'm sorry I missed it. Although, if I had known about it in advance, I would have been sorely conflicted. It was held on the same day as the Takoma Park House and Garden Tour, which I wouldn't have missed for the world, due to the long-wished-for opportunity to explore the inside of the Cady-Lee mansion at the intersection of Eastern Avenue and Piney Branch Road on the DC/Takoma Park, MD border. I gape at this house every time I pass by it. It's a vast and lovely Queen Anne-style Victorian, and it has porches and balconies for miles. I never knew what it was called or anything about it until the Takoma Park house tour was announced, at which point my thought was: I am SO THERE. 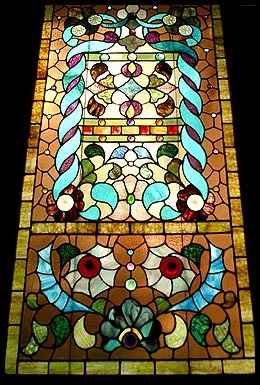 The icing on the Cady-Lee cake was the large, vibrant stained glass window on the landing of the house's main staircase. I never knew that was there, either. A tour volunteer told us that it is original to the house, making the window something like one hundred and sixteen years old. The window is undeniably striking, especially in its prominent position in the front foyer. But I wonder whether any inhabitant of the house has ever been given the heebie-jeebies by the bottom portion of the window. Or am I the only one who sees the face of an evil, undead wild boar there? Red rondels for eyes; highly textured pale yellow glass for tusks; faceted jewels marking the ridge of the snout. I guess the other possibility is that I shouldn't have put all that cayenne pepper into last night's dinner. Jimmy did mention that one stop on his tour was the National Cathedral in Northwest DC. Longtime readers of my site will remember my photos from Cathedral Day 2001. Every September, they open up the cathedral to visitors and make a sort of fair out of it. The best part is the tower climb. If you show up early enough on the day to score one of the limited quanitity of climb tickets, you can take a tour very nearly all the way to the highest point of the cathedral, where you'll see a demonstration of the ringing of the bells, which appears to be a much more athletic activity than you might have guessed. Jimmy didn't know about Cathedral Day, and I was too happy to have the chance to ramble on to him about it. 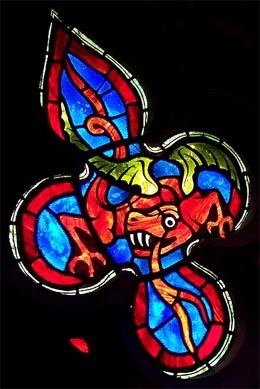 Told him that he must go sometime, if only for the opportunity to get an up-close look at some of the cathedral's 215 stained-glass windows that must ordinarily be admired at a distance. Two days after waxing rhapsodic about Cathedral Day to Jimmy, I found myself in a veterinarian's waiting room with nothing to read. I picked up a copy of a little neighborhood weekly paper and had a browse. Lo and behold: the National Cathedral is looking for docents to conduct tours and educational presentations. "Volunteer docents will receive in-depth training in specific areas, such as iron work, stained glass and gargoyles." Once again: I am SO THERE. If they'll have me. The cathedral is an awfully special place to me, for many reasons, and I think it sounds like a lot of fun spending a few hours a week helping other people fall in love with it too. That really is a stunning window. And while I didn't see that freaky face at the bottom initially, once you pointed him out I think he snarled at me. I didn't see it either when we were standing in front of the window, only today when I was prepping the photo for posting. It's the Amityville Window.